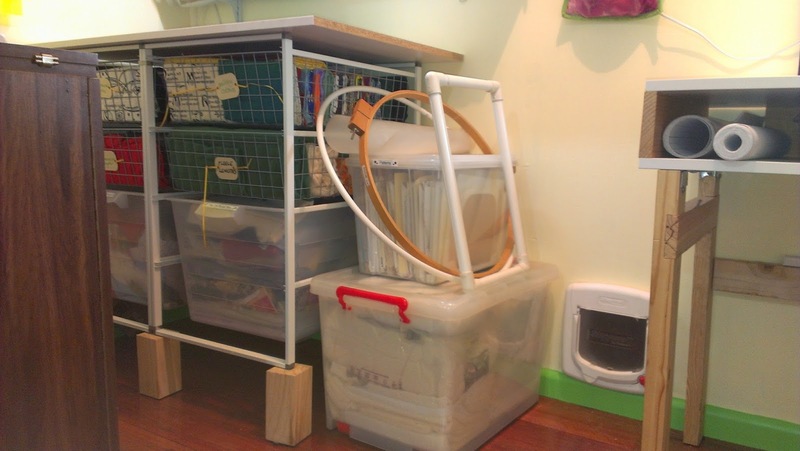 An Ordinary Life: Sewing Room - re-jigged cutting table. 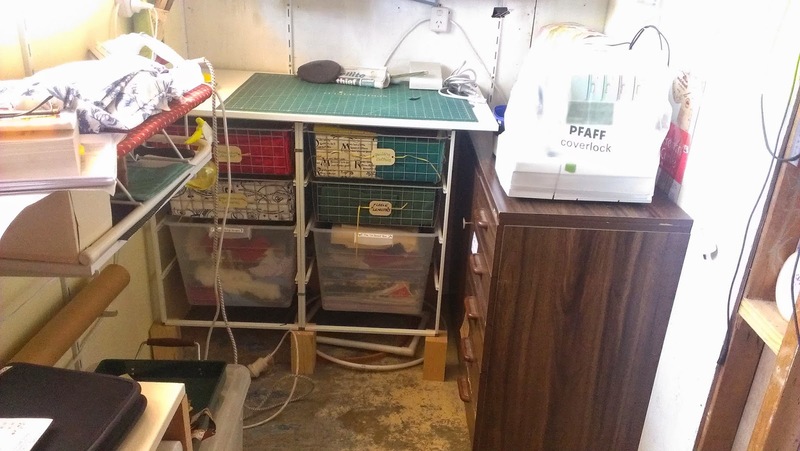 For a long time my cutting table has been a gate-leg table, which was great because it folded away to almost nothing, but it was terrible because it was low. 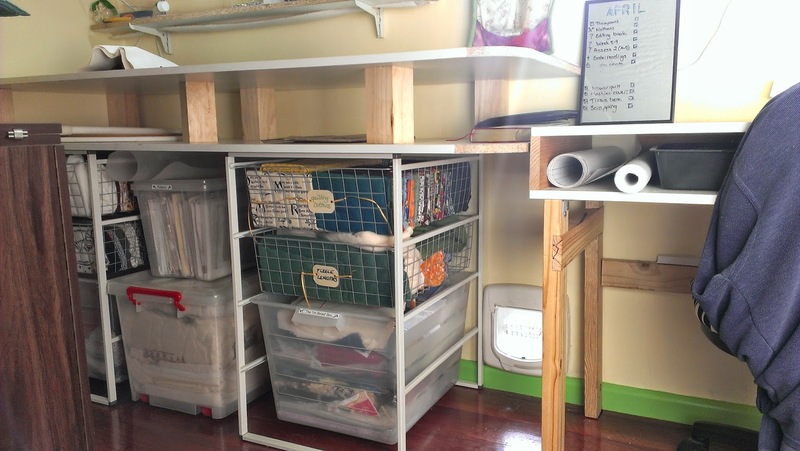 When I moved into my new space I plunked a piece of melamine over the top of my two Ikea Antonius basket racks. One cutting space. Again, far too low for comfort. I had the bright spark of putting some chunks of wood under the frames to raise the cutting table to a more comfortable level. And for several months that has worked fine. The board was a bit small (600 x 1,000 mm), but otherwise it was a pleasure to work at height. Little bit cramped in the corner, but otherwise, worked fine. With my lovely new floorboards I was concerned the wood might scratch, so I added foam to the bottom of my risers. Unfortunately, that made them a bit unstable. Plus the addition of skirtings meant I couldn't solidly 'anchor' them against the wall. There's quite a bit of weight in the baskets and I was a little concerned about them falling over. My set up as of this morning. I did a bit of thinking, and as you do in these things, went about things backwards for a while. My initial thought was to screw a piece of board on top of the blocks and put the drawers on the board - to distribute the weight. While discussing it with a friend I suddenly thought - what am I thinking? Put the frames on the floor, put a board on the top, put the blocks on the board, put another board on top of that. I realised that by doing that, I could separate the baskets, use longer boards, create a larger cutting area AND create storage under it. I wanted to race out and do it straight away, but I had an assignment looming, so I used it as self-bribery. I was not allowed to do ANYTHING towards changing my set up until the assignment was submitted. Well, the assignment is not actually submitted (it is sitting ready for me to proof for stupid mistakes on Monday morning), but today hubby dearest bought me my two bits of melamine, and I now have my extended cutting bench. My bench is now 1,600x600mm (instead of 1,000mm). I have a storage shelf underneath. The tubs no longer sit out to the side looking untidy, but look like they belong where they are. I'm happy to report that this works great. I've been sewing tonight - a piano runner, which is quite long. I've had plenty of space to lay it out and work on it with feeling scrunched up or crowded. Plus, because the cutting table goes all the way to the next bench, when fabric runs off the end it doesn't end up on the floor, gathering cat hair and who knows what. I am very happy with this set up. Sue we have wood floors in our living, kitchen and dining room, our local hardware store sells packs of felt sticky shapes for putting under furniture.